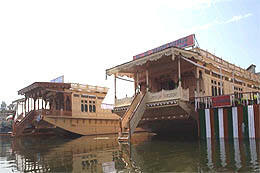 Sikandra Palace Houseboat accommodation in the beautiful vale offers a unique and unforgettable experience. Located Dal Lake, Nehru Park, Srinagar Kashmir. Sikandra Palace - 12 rooms, surrounded by thousands of flowering lotus, are truly made for emperors. Each is approximately 50 yards long. One end contains three/four bedrooms fit for royalty - each with bathroom and dressing room and all the conveniences necessary for private matters and elegant dressing. 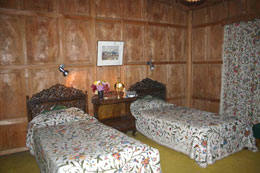 Each room has a hand-crafted ceiling and hand-carved cedar panelled walls. 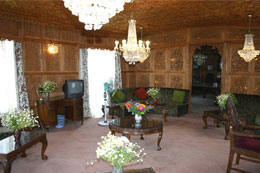 The floors and corridor are thickly covered with traditional and colourful Kashmir rugs and carpets. At the other end of the "palace" there is a huge living room and dining room with similar proportions. Each of these is again totally panelled with hand-carved cedar�this time with ornate designs backed by coloured lights providing dramatic effects with the main lights turned off. 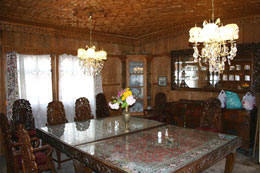 Both rooms are furnished with beautifully carved Victorian furniture. All rooms have movable walls sliding open to reveal an exquisitely beautiful composition of lake, lotus, shikaras, diving kingfishers and wheeling eagles in the foreground; lake, swimming boat, houses among the stretching poplars, and titanic Chinnar trees in the mid-ground; ridges and snow-capped mountains so close and dominating they can hardly be described as taking up the background. We will truly treat you, your family and friends like British Governors ! On arrival Welcome Kashmiri Kawa with Dounuts. Personalized service for anything you need. Fruits to suit your taste.